The 70th Anniversary of VE Day in Washington, D.C. was highlighted by a National Mall flyover of 50-plus warbirds in various formations. Planning the event was a monumental undertaking and the cooperation of multiple federal agencies was a small miracle. With fewer than ten flyable examples in the world, Military Aircraft Museum now owns the newest of these ultra-rare icons from the birth of aviation. More than any other American aircraft, the Jenny represents the early proliferation of aviation and the passion for flight. When RAF 112 Squadron traded their shark-mouthed P-40s for P-51 Mustangs, they transferred the beloved fangs to their camouflaged Mustangs. A modern day representation honors their history and flies with the Boultbee Flight Academy in the United Kingdom. Recently returned to flying status is the stunning Goodyear built FG-1D Corsair of the Cavanaugh Flight Museum. 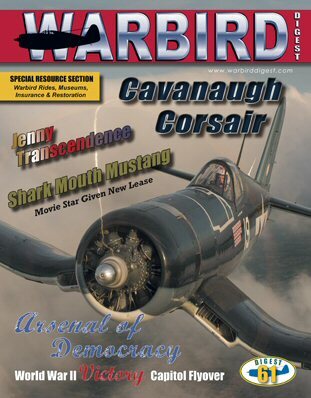 Corsair historian Rob Mears provides an in-depth history of this 70-year-old survivor.